Locked out of your email address, or need help creating one? Don’t understand the error message your phone keeps giving you? Need assistance deleting messages from your inbox or organizing your computer files? We’re conducting free Digital Help Hub sessions in our main lobby six Thursday afternoons during the Spring of 2019. You can bring in your computer, tablet, or smartphone to get 20-30 minutes of personalized assistance with that problem you’ve been having but don’t know how to resolve, free of charge. To make an appointment for one of the following times, please contact Richard Cassidy at 514-935-7344 or richard@atwaterlibrary.ca. If you don’t reserve a place but show up and take your chances, you will be offered a number for the first available slot. HANDS-ON WORKSHOP on Using Government Services Online — Liz Perrin, our most experienced instructor, showed how to access information online about government services — health, housing, retirement income and rights. This workshop was designed to be useful to seniors and their caregivers, and newcomers to Canada. Kim Sawchuk, Concordia Communications Studies Professor and Principal Investigator of the ACT team, shared results of her work with seniors and digital technology. She told stories of seniors making practical and creative uses of computers and cell phones. Q&A and refreshments. HANDS-ON WORKSHOP: Lynn Bennett, Certified Financial Planner, and Liz Perrin, computer instructor, showed how to file an income tax return online. The workshop included an overview of the new provisions of 2018 federal and provincial income tax laws for seniors — changes from last year. Luke Stark explained Artificial Intelligence (AI) for non-techies. He separated the hype from the reality and showed how AI is more about searching for cat photos online or scheduling work shifts than it is about HAL900 or Commander Data. He also gave an overview of the history of human fascination with creating artificial beings, and why that fantasy can sometimes get in the way of a clear-eyed view of the real impacts digital technologies are having on our everyday lives. HANDS-ON WORKSHOP: Lynn Bennett, Certified Financial Planner, and a computer instructor show how to file an income tax return online. The workshop includes an overview of the new provisions of 2018 federal and provincial income tax laws for seniors — changes from last year. Participants are welcome to bring their own device. Space is limited and all places are now taken. 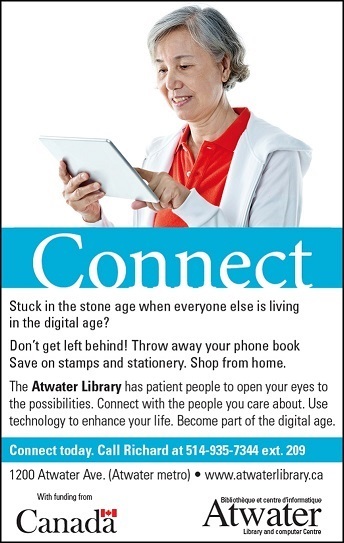 To register for a repeat offering on April 16 at the same time, please contact Richard Cassidy at richard@atwaterlibrary.ca or 514-935-7344 ext’n 206. HANDS-ON WORKSHOP on Buying a Computer, Tablet or Smartphone — Liz Perrin gives a FREE overview of all the issues you need to consider to make sure you get the device that is right for you. Q&A. Registration not required. HANDS-ON WORKSHOP on Digital Basics — Liz Perrin and Richard Cassidy give FREE coaching to help you get started. Q&A. Registration not required.